Why Choose our wireless Bluetooth headset? Built-in 90mah earbuds battery enjoys up to 5hours of talk/play time. Support IOS / Android device power display. Ergonomic wireless earbud design, comfortable to wear. feel free to charge it anytime, anywhere Can be put in the pocket. Stylish bluetooth earpiece, invisible, smallest, ideal for enjoying music while walking, meeting, reading. How to Pair for the first use? 1. Single use: Long touch the MFB for about 6s on either earbuds until flash blue and red alternately, then turn on the bluetooth on the phone to search the new equipment and find the corresponding bluetooth name"TWS R / L" to connect. 2. Couple use: Press the both MFB for 6s until two earbuds get into pairing mode until R and L earbuds flash Red and Blue alternately. After both earbuds had been connected, then turn on the bluetooth on the phone to search master earbud "TWS R" and click to connect. Done! 【Small And Portable Wireless Earbuds With Charging Case】 Equipped 1000mAh battery in the portable magnetic charging case, which can support 7-8 times fully charging for the wireless earbuds. Never worry about low battery when you are out all day. And each earphone has Built in 90 mAh lithium polymer battery, enjoy about up to 5 hours of premium quality music playtime and 5 hours talk time after fully charged. 【Using The Latest 4.2 Bluetooth Chip】transmission stability, Provides faster pairing, stable connection and signal transmission (10meters no-obstacle range). Noise cancellaing technology reduces ambient noise and echo, enable clear sound no matter in calls, stealth listening or watching videos at work or in the office. Easily switched between voice call and music. 【Three Different Ways To Wear】For secure and comfort wear, our wireless earbuds is carefully designed according to ear geometry, 3 different sizes of soft ear cups included for comfort and secure fit. Light weight and sweatproof allowing running, jogging, and high intensity activities to be enjoyable. Say goodbye to earphones cable annoyance. 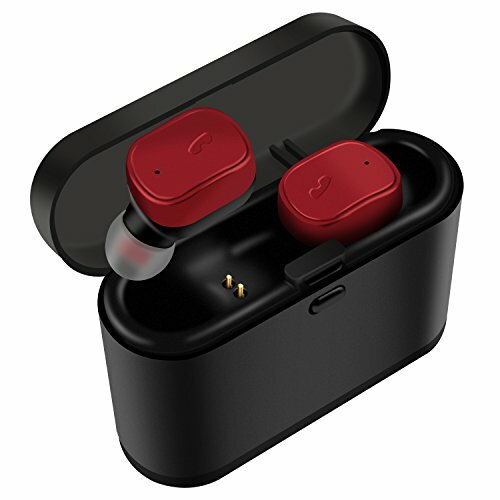 【Multipoint Connection And Share Mode】true wireless earbuds, Multipoint pairing for use with two devices at the same time and answer calls from either one. Supports both earbuds for phone calls. These wireless earbuds can be also used dual or separately as you wish, which means you can share the same music/movies with friends and enjoy the clear stereo sound by using both headset. 【Great Compatibility And High Quality After Sales】 This wireless earbuds Bluetooth stereo, compatible with a such as iPhone & Android and tablet etc.various kinds of Bluetooth devices.Note: We provide 90 DAYS HASSLE-FREE RETURN POLICY and ONE YEAR WARRANTY, your purchase is totally RISK-FREE. If you have any questions about this product by Shayson, contact us by completing and submitting the form below. If you are looking for a specif part number, please include it with your message.